Today I want to welcome book blogger Justine Vandale author of the Shelves of Books Blog as part of my Show This Blogger Some Love! You may or may not be aware that the publishing industry is in a state of flux. Ereaders and indie authors have permanently altered the book lover's landscape and book bloggers are becoming an increasingly integral part of the reading conversation. That Amazon bought Goodreads. last Thursday highlights the value that the publishing industry places on independent reviewers of books. Lots of book bloggers hang out on Goodreads. How all this will shake down is anyone's guess, but my bet is that book bloggers are here to stay. So I hope you'll enjoying learning more about who they are and what drives them in this series of interviews that I'll be hosting through the end of April. 1. Introduce Yourself. Hey I'm Justine. I am 23 years old and I recently married my high school sweetheart on the beautiful beaches of Hawaii. 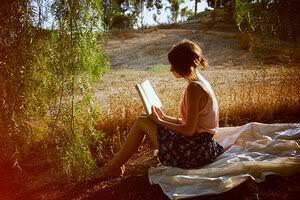 I love reading books!!! I mostly read YA and biographies but have recently started getting out of my comfort zone and reading other genres. 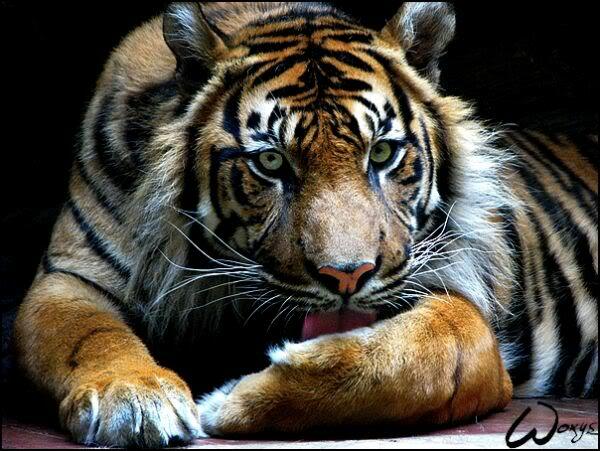 I am also an animal lover. I have a pug/ cocker spaniel named Steve and a cat named Obie. 2. Coffee or Tea or Water? Espresso, Drip, Instant, or French Press? Bag or Looseleaf? Bottled, Filtered, Tap or Rainwater? TEA!!! I hate coffee it's so bitter. Ill pretty much drink any kind of tea except for fruity flavors. 3. Why do you blog about books? I started a blog for all of my reviews because I noticed that lots of other reviews have them and I wanted in on it. 4. What inspired the design of your site? Mine is pretty generic. But I have shelves of books so that where I got the name from. 5. What is your favorite thing about book blogging? I love having people come and read my posts and leave a comment. 6. How do you decide which books to read? 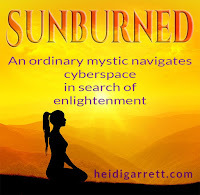 Before I would read just what I wanted but then I became hard to pick a book to read so I started joining book clubs and blog tours to expand my horizons. 8. Care to comment on the Alice Hoffman quote: Books may well be the only magic? It's true. Books take you places in your imagination that you didn't know were even possible. They also make you feel emotions you have never experienced. 10. Is there anything else we need to know about you? I think that pretty much covers it but if you want to know anything else let me know. One of the really cool things on Shelves of Books is the mini-banner across the top of the page that links to Justine's Goodreads reviews of her favorite books with a single click. That should help any reader find their next great read! Justine, thank you for letting us get to know you better. Over the past year or so, my fascination with book bloggers has grown. What began as an effort to obtain reviews for my books, became something else. The more time that I spent on the book blogger's sites, the more intrigued I became with their unique styles of reviewing books and creating great places for bibliophiles to hang out online. So I've invited some book bloggers to be interviewed. These folks invest a lot of time and energy in reading, sorting through books, and sharing their opinions. I wanted to learn more about who they are and what drives them. I hope you'll enjoy learning more about them, too. I'm honored to present the first interview with Candace of Candace's Book Blog & CBB book promotions. 1. Introduce yourself. 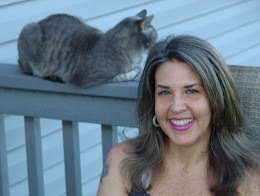 My name is Candace, I run Candace's Book Blog and I've been blogging books since 2008 but have been pretty immersed in the online book community since 2005 when I discovered Shelfari and immediately started connecting with authors and book people. 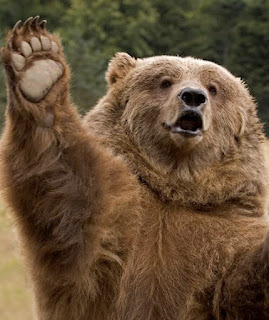 I read most genres and review young adult, middle grade, children's books and adult books on my blog. All are well labeled but reviews are clean whether it's an adult book or not. I'm married and have two children, a daughter who's 8 and a son who's 4. I live in the gorgeous Pacific NW but grew up in Sturgis, SD (yes, where the motorcycle rally is). Besides being a book blogger I run CBB Book Promotions and do book promotions like blog tours and on going publicity for authors. 2. Coffee or tea or water? Espresso, drip, instant, or french press? Bag or looseleaf? Bottled, filtered, tap or rainwater? I drink coffee in the morning. Usually only about half a cup or so as I'm weaning myself off. I juice in the afternoon and other than that I usually drink water. 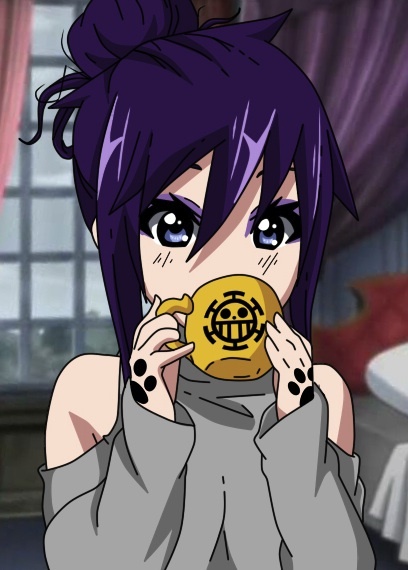 I do drink tea when I'm needing an extra immune booster too. 3. Why do you blog about books? I started blogging because I wanted to record my thoughts on the books I read and have it all in one place. Soon after I had my son and I didn't read as much for a few months but then when I went back to it I pretty much immersed myself in the blogging community and found I didn't just want my blog for me, I wanted to share it with everyone! I started another blog at the same time about cloth diapering and green living and while it's another passion of mine I found myself loving the book blogging more and ended up deleting the other blog. I started my blog at the same time as two friends of mine and we have supported each other the whole way and run several yearly events together. They are Lori at Pure Imagination and Angela at Reading Angel. 4. What inspired the design of your site? My friend Lori (mentioned above) is a blog designer and so I just told her something bookish and magical. She had me pick out some different images I liked and then she played around with them and came up with something gorgeous! I have had her update the design to be more streamlined and add in CBB Book Promotions but I've kept the majority of it since I love it so much! 5. What is your favorite thing about book blogging? Where to start? I love the community and feeling connected to so many like minded people and sharing my book thoughts with them, I also love helping out authors that need help getting their books out there. 6. How do you decide which books to read? Oh geez, that can be a tough one. First of all I read by mood. There's no point in picking up a book that doesn't fit my mood cause then I'll end up liking it less. But for the most part it's by what I have acquired first when it comes to review copies. Since I went to ALAMW I put all my books in order of release so I work my way through them so I can review around their release date. But since I have so many Indie books on my kindle I read at least one a week from that 'pile' by order they came in (if for review). 7. How much time do you invest reading and blogging? Lots.WAY more than I should probably. How I like to do it is mornings are for reading and doing housework, etc. I usually get at least an hour in of reading. Then I spend time with my husband before he goes to work. Around 1:30 I get on the computer and I'm on and off the rest of the afternoon. I have a 4 year old at home all day so I have lots of interruptions, but it's still a few hours a day. Then before bed is reading time, which is about 2 hours of reading. While I spend 5 or so hours on the computer a day most of it is working on blog tours and other author promotions I'm doing. It's hard to say how much is actual blogging. 8. Care to comment on the Alice Hoffman quote: Books may well be the only magic? Books make it so we can experience anything. We can travel anywhere, we can be anything and anyone we want, and go through things we can only dream of. 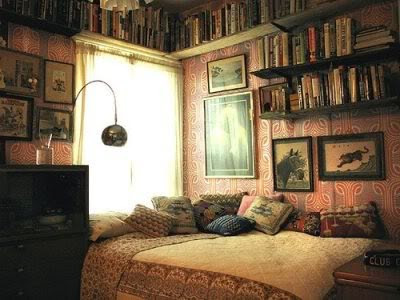 Books ARE magic. 9. On a scale of 1-10, how eccentric are you? 10 being VERY… I don't know... maybe a 6? The things that use to make me eccentric are now pretty common. I'm a vegetarian (mostly vegan actually), I used cloth diapers (he's potty trained now though), I juice, I try to grow my own food as much as possible, I prefer to avoid any GMO foods and eat all organic (when it's possible). I dye my hair red (often a variety of reds) and... I think that's about it! 10. Is there anything else we need to know about you? I don't think so. I'm sure I forgot something important, but I'm not thinking of it right now! Saturday Situation with links to hundreds of reviews and giveaways! 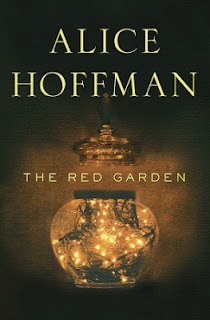 I'm still in the midst of The Red Garden by Alice Hoffman. Tonight, I finish the "The Monster of Blackwell." 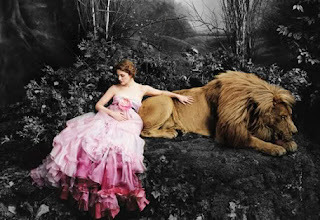 It's bruising and graceful—a tender, aching spin on the iconic tale of beauty and the beast. Red-haired Kate is the beauty; and Matthew's the beast that hides in the woods and becomes a bear. One day Kate loses herself when she loses a boy; Matthew finds them both. And so begins another kind of hiding, a different way of seeing, but it's all wrapped up in melancholy. Because Matthew is so ugly he can't even look at himself and people run away from him. And Kate is the daughter of the free-spirited sister, Azurine, who went to Paris in the story before. That's how The Red Garden works, a loosely woven cloth that the forward momentum of time unravels thread by thread. I want Matthew to stay, to become an impressive man on the outside, too. That would be a different fairytale, charming and soft. Not one that cuts so deep you nearly die from a single wound. Sigh. I can only read one story at a time. March 20, 2013 is the first day of spring and to celebrate the end of winter, we're revealing the cover for the next installment of the Queen of the Realm of Faerie series. Thirty-three awesome bloggers will host The Dragon Carnivale Cover Reveal + $25 American Express Gift Card Giveaway. Show This Blogger Some Love! Everyday, you can enter to win by visiting a different site and gushing over their blog! The giveaway will extend 33 days so you'll be able to show all these bloggers some love. Kindle Obsessed Because Life's Too Short For Crappy Books! Known to Read Avidly reading & reviewing books. Enthralled by Books To Read or Not to Read…That is a Silly Question. Bookworm Lisa~ Focusing on family friendly books. Welcome to the Alice Hoffman Birthday Blog Hop! 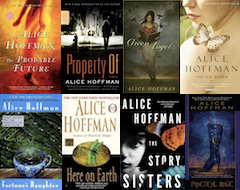 Today, March 16, 2013, I'm thrilled to be celebrating Alice Hoffman's birthday with other readers who love her unique and inimitable voice. 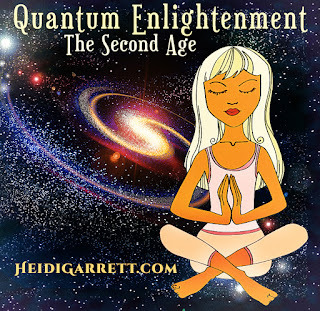 Please visit all the sites linked at the bottom of this post for the complete experience! 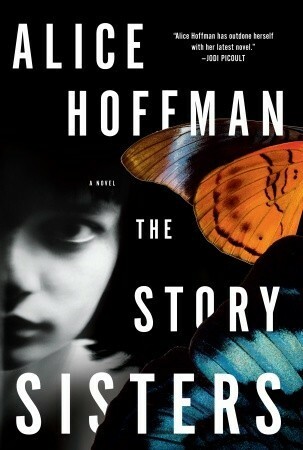 I intended to write this post on Claire Story of The Story Sisters, having recently read the book for the second time. The first time I read it I fell in love with Elv. Her fierce love of horses, her inability to reduce her sensitivities to socially acceptable levels, her sacrifice of self to protect her youngest sister, along with her ability to see fairies and demons, kept me glued to every page. And when her life took an unexpected twist I sat in my papasan chair and sobbed. Not the dainty, a few hot tears rolling down my cheeks, sniffles, no, it was the snorting, messy kind that you never want another human being to witness, but feels so cleansing when it’s over. Brave, reckless Elv. I resurrected a pair of black leather cowboy boots with pointy toes and got another tattoo, a daisy fairy on my left hip. But after the second read, I’m on the lookout for charms. Because this time, I'm enthralled with Claire. She’s the one who was strong enough to love both her sisters. Which brings me to another thing I love about The Story Sisters, it’s unflinching when it comes to the girl’s complex relationships. I have a friend who is an only child and doesn’t get how beastly sisters can be to one another. I have sisters. Our relationships are strained and complicated, too. Perhaps that’s why these words in Arnish—spoken at dusk—can bring tears to my eyes: Nom brava gig. My brave sister. Reunina lee. I came to rescue you. Alana me sora minta. Roses wherever you looked. My sisters are velvety petals with thorns, too. Claire won me over with her silence. And her rebirth. Learning to make jewelry, mastering the craft. No matter how conventional wisdom goes on and on about family and friends, sometimes soulful work is the only thing that keeps some of us alive. So that was my plan for this first Alice Hoffman Birthday Blog Hop, gush about Claire Story and Arnish, maybe Pollo—and Pete who wraps all the broken Story women in bandages of strength and dignity while they conjure the will to move forward, but now I’m reading The Red Garden. Quite frankly, I’m a little bit stunned. It’s a collection of contemporary-ish fairy tales. I’m not a fan of short stories. Perhaps because it seems like a lot of investment, getting to know the characters, the setting, etc. and then—whiff—they’re gone. It’s over. But I read Leaf Storm by Gabriel Garcia Marquez last year, and found it enjoyable and fascinating. Marquez linked his collection of stories around a single place, the fictional town of Macondo, Colombia. When I discovered all the tales in Hoffman’s The Red Garden wind around and through rural Blackwell, Massachusetts, I became curious. There are fourteen tales. I’ve read seven. The stunned part is how each one builds, externally, the literal place of Blackwell, and internally, the pressure upon the heart of the reader. It all begins with Hallie finding refuge in that bear. And her cub. And then comes John Chapman with his apple seeds and innocent passion. By the time Sophia snatches up the card of death and Amy is buried in her blue dress and bare feet, the magic is palpable. When Emily’s long walk ends in the frenzied creation of a scent-focused garden for Charlie who’s lost his sight, we’re left with a taste of wistful in the mouth and the sense of crushed potpourri in the hand. Remember Amy and her blue dress? She may be gone, but somehow she manages to save Evan and Mattie when nothing and no one else can. But when Topsy, the elephant, dies, it leaves a gash in your heart. Thank goodness, he gets reborn as a pug whose devotion will make you remember that man is a syllable of woman. I can’t wait to read The Fisherman’s Wife tonight. 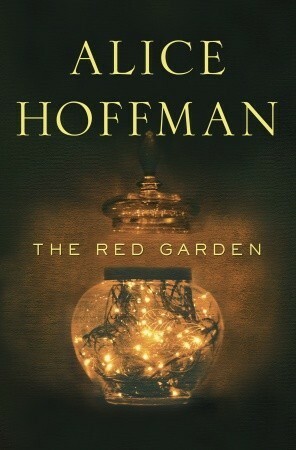 Because in The Red Garden Alice Hoffman has doubled her creation of place. Since Jess and I decided we wanted to create this blog hop, I’ve been asking myself: What is it about Hoffman’s work that moves me, affects me, wrings me out on such deep levels? With her stories, Hoffman creates a place for the weary, the wounded, the ravaged, the savaged, the damaged, the self-contained, and the lonely, to take off their hats and coats and rest. Among the world of her characters we’re not too sensitive, we’re not too broken, we’re not too full of sorrow, and we’re not beyond comprehension; we’re one of them. I think that’s why I have to read an Alice Hoffman book every few months. Sometimes daily life breaks me down, breaks down the things about me that I love about myself; reading Alice Hoffman is getting an IV drip. In her pages, I get to live in a world where I’m not too weird—spinning off an another wavelength—I’m the norm. It’s such solace. It’s so hopeful. It reconnects me to humanity. And that is a holy thing. When I was younger, I didn't realize that showing up is more than half the battle. I might withdraw, disappear, or otherwise absent myself with relatively minor excuses, and certainly I felt justified in not showing up when larger, easier to rationalize events occurred. All this achieved was missing out on a lot of wonderful opportunities, experiences, and relationships. Fortunately, I've since learned that showing up does a lot of the work for you. Two examples. The first, Indie Recon. I was in the middle of that first draft of the third book in my series. My goal was to finish it by the Friday of the following week. It was hard to convince myself that I could attend both the con and get that draft done, even though I could attend the con in my pajamas. Which I did, once I reminded myself that all I had to do was show up. Turn my computer on, get to the IndieRecon website, and follow along with the schedule as best I could. Thank goodness I did. I was inspired, motivated, educated and had tons of fun. I even got the nerve up to ask some questions in the virtual sessions. The responses I got from the presenters were more than helpful. And I'd never participated in a Twitter chat before, so I did, and loved it. I also won a first chapter critique from best selling indie author, Denise Grover Swank. It all began with showing up. Then the con was over. It felt pretty much like every single fuse in my brain had been blown. I had been exposed to so much information that I was on overload. Certainly, it would be impossible to finish that draft on schedule. Here's the second example. Showing up for writing. I coaxed myself. Turn on the computer and start pressing some keys. String together a few words. Go for a sentence. I did. And I finished the draft on schedule. Because a lot of times all we really need to do to succeed, to have a wonderful time, or to experience a life-changing moment is show up. And I'm beginning to believe that one of the most valuable things we can do as indie authors is: Show up. Show up for writing, show up for our blogs, show up for twitter … show up for our readers.